Barragán et al. (2016) present the detection of EPIC 211391664b, a transiting Neptune-sized planet in a 10.14 day orbit around an F-type star that is located ~1400 light years away. From transit and radial velocity observations, EPIC 211391664b has ~4.3 times the radius and 32.2 ± 8.1 times the mass of Earth. For comparison, Neptune has 3.9 times the radius and 17.1 times the mass of Earth. Although only slightly larger in size than Neptune, EPIC 211391664b has almost twice the mass of Neptune. EPIC 211391664b joins a relatively small group of Neptune-sized planets whose mass and radius are known to better than 3σ. The equilibrium temperature on EPIC 211391664b is estimated to be ~1100 K. In about 3 billion years from now, EPIC 211391664b is expected to be engulfed as its host star evolves into a red giant. Oberst et al. (2016) present the discovery of KELT-16b, a highly irradiated, ultra-short period hot-Jupiter transiting a relatively bright F-type main sequence star. Transit and radial velocity observations indicate that KELT-16b has ~1.415 times the radius and ~2.75 times the mass of Jupiter, giving it a mean density of roughly 1.2 times the density of water. KELT-16b circles its host star every 23 hours 15 minutes. This planet joins WASP-18b, WASP-19b, WASP-43b, WASP-103b and HATS-18b as the only transiting hot-Jupiters with orbital periods under a day. The host star of KELT-16b has ~ 1.211 times the mass and ~ 1.360 times the radius of the Sun, and its effective temperature is 6236 ± 54 K.
Due to its ultra-short orbit, KELT-16b is highly irradiated by its host star, and its estimated equilibrium temperature is ~2453 K. The large day-to-night temperature difference on KELT-16b may be extreme enough for gaseous titanium oxide (TiO) and vanadium oxide (VO) to condense and rain out at the planet’s day-night terminator. At present, KELT-16b orbits only ~1.7 Roche radii from its host star. The Roche radius is basically the distance from its host star whereby KELT-16b is expected to become tidally disrupted. 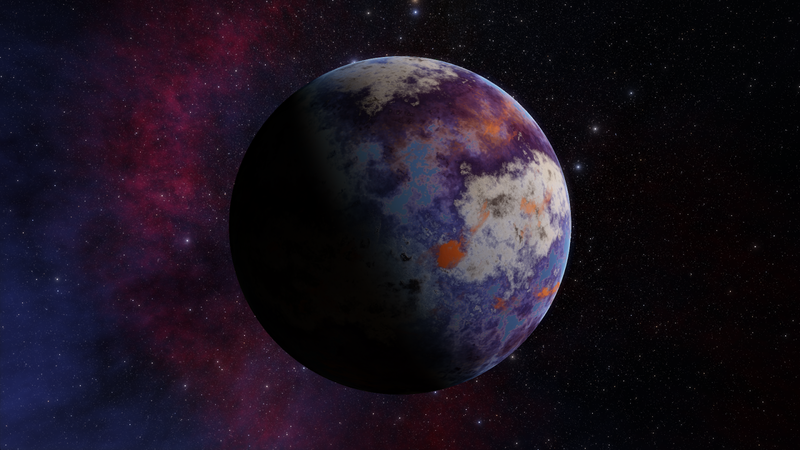 Tidal evolution models predict that KELT-16b could be tidally shredded by its host star in as little as half a million years. 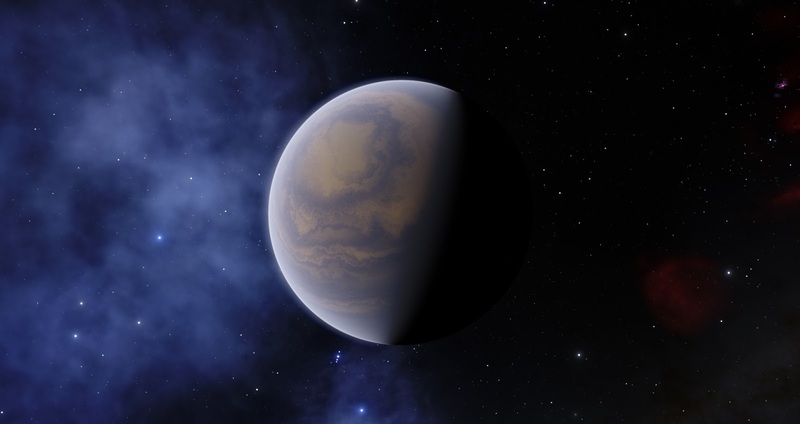 Figure 1: Artist's impression of an exoplanet. Kepler is a planet-hunting telescope that searches for planets that transit their host stars. It is most sensitive to planets with short orbital periods. Nevertheless, Foreman-Mackey et al. 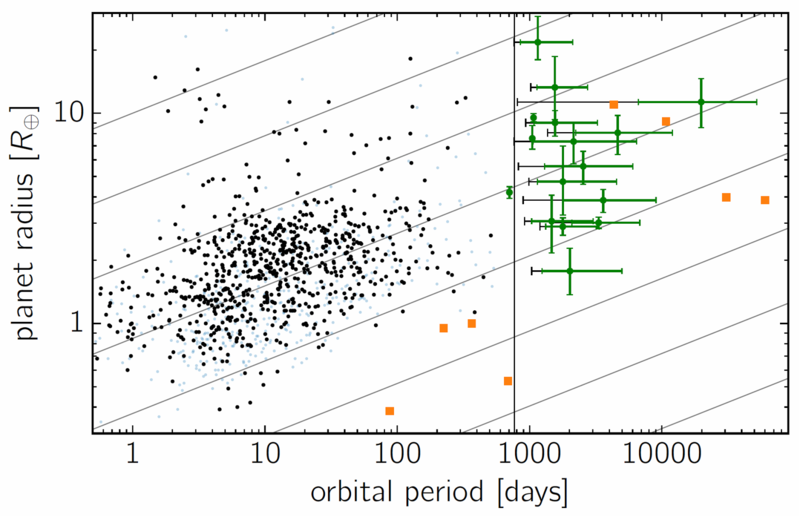 (2016) performed a fully automated search for long period planets with only one or two transits in the archival Kepler light curves. The search was done for ~40,000 Sun-like stars and it led to the detection of 16 long period planet candidates. These planet candidates have orbital periods between 2 to over 50 years. Based on this finding, the occurrence rate of planets with orbital periods in the range 2 to 25 years and radii in the range 0.1 to 1 times the radius of Jupiter is estimated to be 2.00 ± 0.72 planets per Sun-like star. 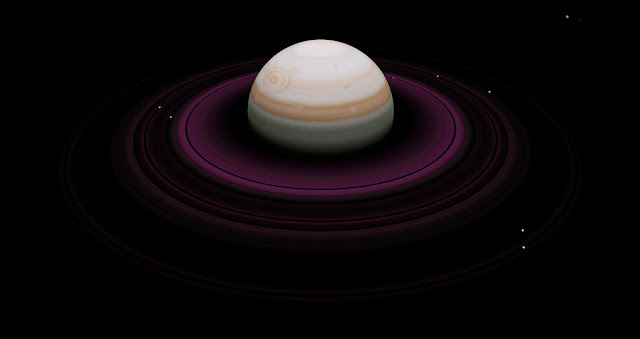 WASP-127b is a heavily inflated super-Neptune with 0.18 times the mass and 1.35 times the radius of Jupiter. This means the density of WASP-127b is only ~7 percent the density of Jupiter, making it one of the least dense planets known. 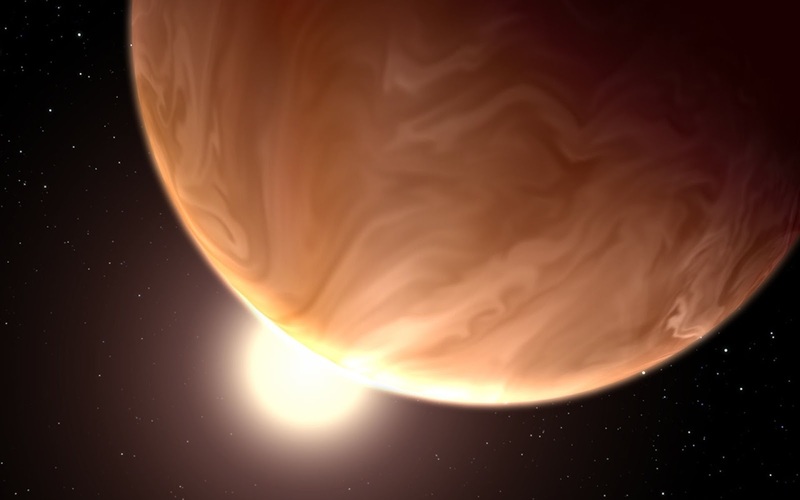 In fact, the surface gravity on WASP-127b is over 4 times weaker than on Earth. WASP-127b is in a 4.178 day orbit around a G5 main sequence star that has 1.31 ± 0.05 times the mass and 1.33 ± 0.03 times the radius of the Sun. The heavily inflated nature of WASP-127b gives the planet a very extended atmosphere with a remarkably large scale height estimated to be 2500 ± 400 km. Such a “puffy” atmosphere makes WASP-127b an ideal target for transmission spectroscopy. Being so close to its host star, the temperature on WASP-127b is estimated to be ~1400 K.
G2 is a dusty object in a highly eccentric orbit around the supermassive black hole in the center of the Milky Way galaxy. At closest approach, G2 is only ~200 AU from the supermassive black hole. G2 could be a low-mass star hosting a protoplanetary disk or a planet that was captured by the supermassive black hole. Trani et al. (2016) ran 10,000 simulations of a three-body hierarchical system comprised of a supermassive black hole, a star and a planet initially in a bound orbit around the star. The simulations show that the planet can be removed from its host star and be captured into an independent orbit around the supermassive black hole. However, none of the simulated planets can achieve a highly eccentric orbit around the supermassive black hole. The smallest closest approach distance is 1750 AU, roughly 9 times larger than the closest approach distance of G2. Nevertheless, perturbations from other stars around the supermassive back hole can potentially perturb planets into highly eccentric orbits similar to the orbit of G2. Brown dwarfs are objects that formed in the same way as stars and they have masses between 0.01 to 0.08 times the mass of the Sun. 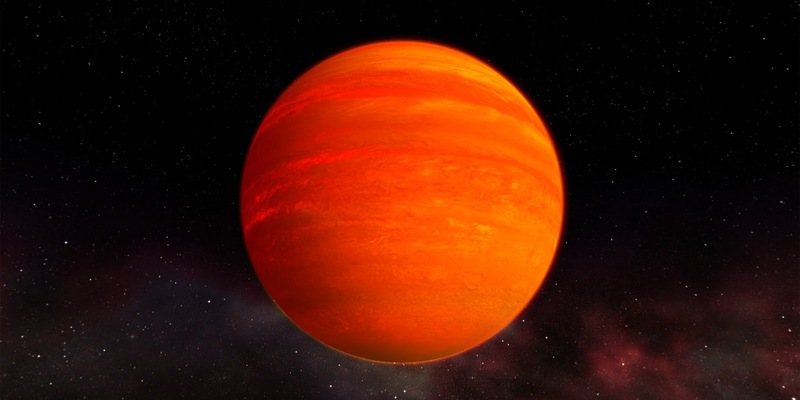 However, brown dwarfs are not massive enough to sustain hydrogen fusion in their cores. Just like young stars, young brown dwarfs can also be surrounded by dusty disks. From a sample of 29 well-characterized brown dwarfs and very low mass stars with masses ranging from 0.03 to 0.2 times the mass of the Sun, Daemgen et al. (2016) found that more than half of them have disk mass greater than one Jupiter-mass. The dust in the disks is estimated to have temperatures in the range between 7 to 15 K. Jupiter-mass disks around brown dwarfs have the potential to form Earth-mass planets. This shows that brown dwarfs can harbour sufficient material in their disks to form Earth-mass planets. 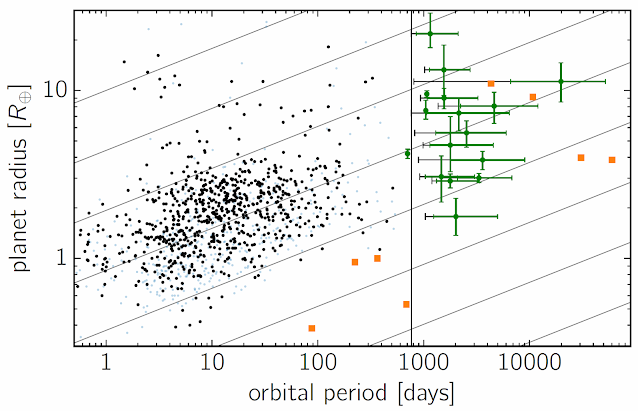 Kepler has discovered many planetary systems consisting of multiple small planets with orbital periods less than ~50 days. 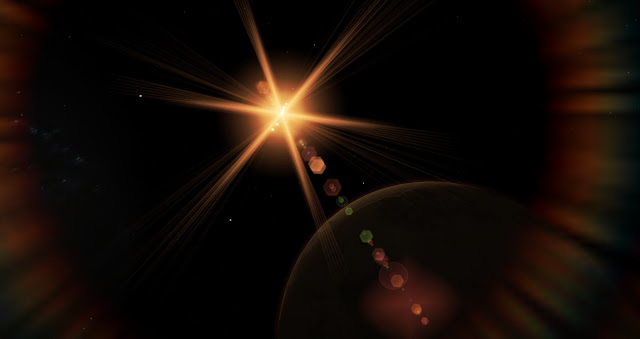 These compact planetary systems are known as Systems with Tightly-spaced Inner Planets (STIPs). Kepler-80 (KOI-500) is one such STIP. It consists of 5 transiting planets identified as planets "f", "d", "e", "b", and "c"; and their orbital periods are 1.0, 3.1, 4.6, 7.1, and 9.5 days, respectively. Additionally, the 5 planets have ~1.21, ~1.53, ~1.60, ~2.67, and ~2.74 times the radius of Earth, respectively. Measurements of the transit times and transit timing variation (TTV) analysis indicate that the outer four planets ("d", "e", "b", and "c") have ~6.75, ~4.13, ~6.93, and ~6.74 times the mass of Earth, respectively. The similar masses but different radii is consistent with planets "d" and "e" having Earth-like compositions, and planets "b" and "c" with Earth-like cores surrounded by ~2 percent (by mass) hydrogen-helium envelopes. The orbits of the four outer planets are also in a rare dynamical configuration. The host star of this planetary system is a K5 main sequence star located ~1200 light years away. It has 0.678 times the radius, 0.730 times the mass and 0.170 times the luminosity of the Sun, and its effective temperature is 4540 K.
2015 RR245 is a dwarf planet candidate detected by the Outer Solar System Origins Survey (OSSOS). It is in an eccentric orbit around the Sun. 2015 RR245 comes as close as 34 AU to the Sun and recedes as far as 130 AU from the Sun. If the albedo of 2015 RR245 is assumed to be 12 percent, then 2015 RR245 should have a diameter of approximately 670 km. 2015 RR245 is trapped in a 9:2 mean-motion resonance with Neptune and it is the first known Trans-Neptunian Object (TNO) to be in this orbital resonance. Mróz et al. (2016) present the discovery of a high mass ratio system from a gravitational microlensing event. The planet to host star mass ratio of this system is 0.0117 ± 0.0004. However, the mass of the host star is not well constrained. If the host star has the same mass as the Sun, the planet's mass would be ~12.2 times the mass of Jupiter. With this mass, the planet would be just below the deuterium-burning limit, generally regarded as the boundary separating planets and brown dwarfs. 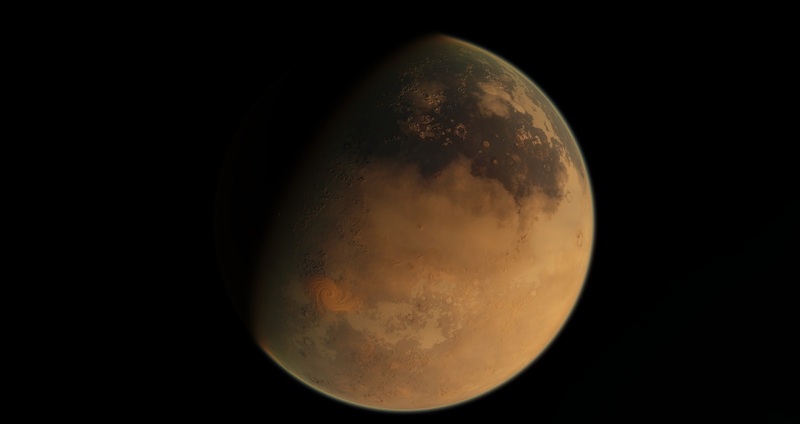 If the host star has a lower mass, then the planet's mass would be smaller. Nevertheless, even if the host star has 0.18 times the mass of the Sun, the planet would still have roughly twice the mass of Jupiter. Having such a high planet to host star mass ratio makes this planetary system quite an extremely one. 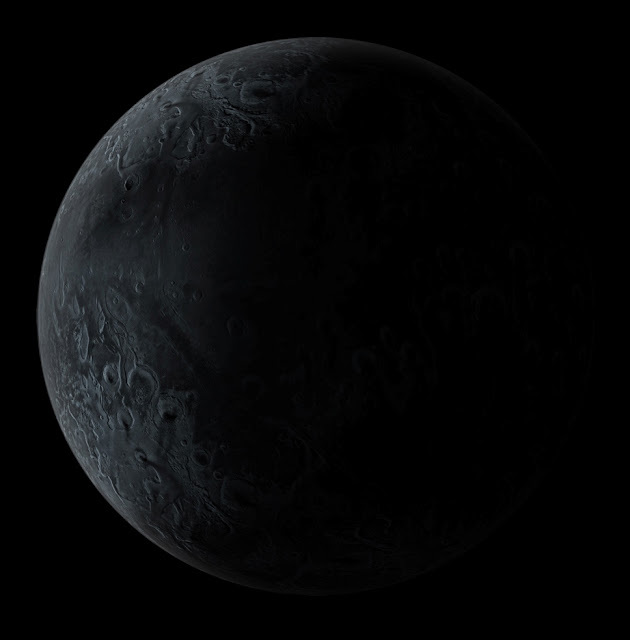 The planet is identified as OGLE-2016-BLG-0596Lb. HD 3167 is a Sun-like star with ~0.88 times the mass and ~0.83 times the radius of the Sun. It is located ~150 light years away and its effective temperature is 5367 ± 50 K. Using data from the K2 mission, Vanderburg et al. (2016) present the discovery of two super-Earth-sized planets transiting HD 3167. The two planets are identified as HD 3167b and HD 3167c. The inner planet, HD 3167b, has 1.595 ± 0.084 times the radius of Earth and its orbital period is only 23 hours. HD 3167b is an example of an ultra short period planet. Its equilibrium temperature is estimated to be 1560 ± 130 K. HD 3167b is expected to be predominantly rocky as the intense radiation from the host star is likely to have stripped away any thick gaseous envelope. 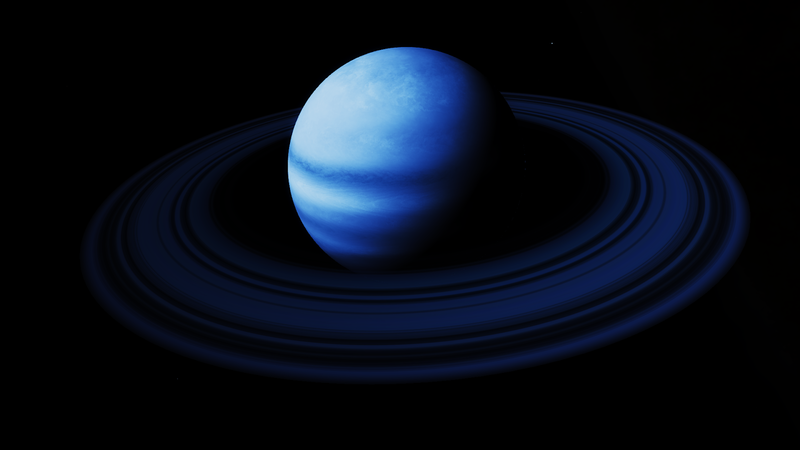 The outer planet, HD 3167c, has 2.89 ± 0.20 times the radius of Earth and its orbital period is 29.845 days. 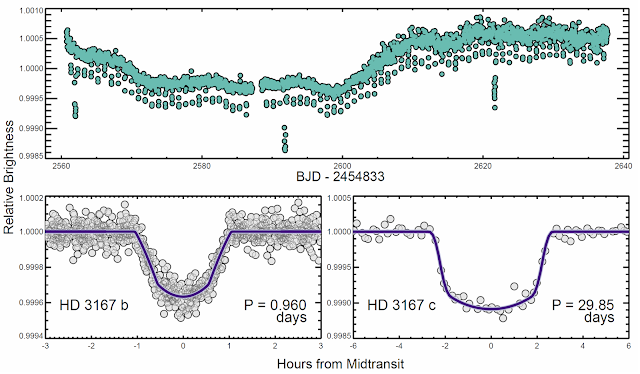 The planet's equilibrium temperature is estimated to be 500 ± 40 K.
HD 3167 is one of the closest and brightest stars with multiple transiting planets, making it a good target for follow-up observations such as transmission spectroscopy and radial velocity observations. The two planets around HD 3167 have widely separated orbital periods. The orbital period of HD 3167c is more than 30 times larger than the orbital period of HD 3167b. This could indicate the presence of additional, non-transiting planets between HD 3167b and HD 3167c.